Apple event: more celebrity than substance? What do we remember the most about Apple's latest event ? Most of the coverage has focused on the number of celebrities that attended - oh and Apple TV+, Apple Arcade and Apple Card were announced too. 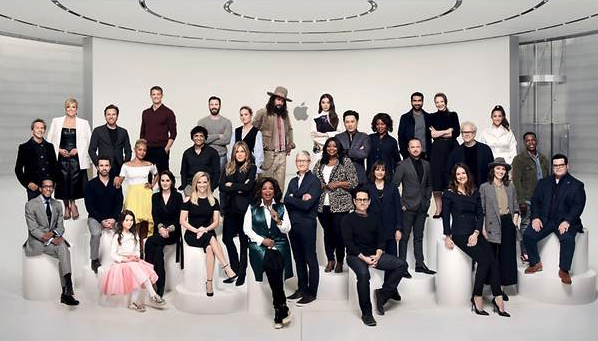 Captain America (aka Chris Evans) and Aquaman (aka Jason Momoa), joined Oprah Winfrey, Steven Spielberg and Jennifer Aniston as part of the inaugural star-studded class of Apple TV+. Also attending was Euan McGregor, Jada Pinkett, Reese Witherspoon, Steve Carell, Tim Robbins, M. Night Shyamalan, J.J. Abrams, Big Bird, and the list goes on. Apple TV+, will be a new subscription service marking Apple's foray into original television production and streaming. At the heart of Apple TV+ will be new original programs. The service will not carry advertising and will begin this fall (Australian spring) in more than 100 countries. It will also include programs from other television networks like HBO, Showtime, Starz and CBS. Apple’s new venture has taken the company far from Silicon Valley and thrust it into alien territory: Hollywood. Or, to be more precise: Culver City, California, the former home city of Metro-Goldwyn-Mayer, where Apple is building a new 128,000-square-foot headquarters for its entertainment division. Since October 2017, Apple has spent well over $1 billion on original programming. Five shows have completed filming, and another half-dozen will be finished in the coming months. Apple has ordered about two dozen series altogether. But Apple is coming late to the game. Netflix has been making original programming for seven years and will spend at least $10 billion on content this year. Amazon and Hulu have also made tremendous inroads with the industry. Short of a new iPhone or gadget to rival - or even match - competitors like Samsung and even Huawei; the current focus seems to be on new ways to encourage the faithful not to abandon their Apple devices. The new services represent an evolution of Apple’s business. For years, Apple focused mainly on selling devices, counting on consumers to upgrade phones and tablets every few years. Now the company is keying on selling content and services for its roughly 1.4 billion active devices. Aside from plans for its new monthly subscription services for TV programming, it announced a new $9.99 tier of the Apple News app called Apple News+ that includes magazine content. It also announced a video game bundle called Apple Arcade. Finally, the company also says it will release its own credit card, called Apple Card, in partnership with Goldman Sachs. Photo Credit: Art Streiber courtesy of Apple. Seated (left to right): Rob McElhenney, Brooklynn Prince, Michelle Dockery, Reese Witherspoon, Oprah Winfrey, J.J. Abrams, Jennifer Garner and Josh Gad. Standing (left to right): Brian Grazer, Ron Cephas Jones, Jane Krakowski, Ewan McGregor, Jada Pinkett Smith, Joel Kinnaman, M. Night Shyamalan, Chris Evans, Brie Larson, Jennifer Aniston, Jason Momoa, Tim Cook, Hailee Steinfeld, Octavia Spencer, Jon M. Chu, Alfre Woodard, Rashida Jones, Kumail Nanjiani, Aaron Paul, Emily V. Gordon, Tim Robbins, Sara Bareilles, Aly Raisman and Leslie Odom, Jr.
©VoicePlus 2019. All rights reserved.